The ICC says it will continue to study the complaints filed against Duterte in spite of his dismissal of the institution. 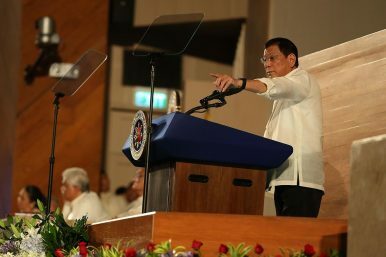 Earlier this month, the International Criminal Court (ICC) announced that it would continue to study complaints filed against Philippine President Rodrigo Duterte’s war on drugs despite his unwillingness to recognize the legitimacy of the body. The announcement marks the continuation of international legal scrutiny around one of Duterte’s most controversial policies as president. Since coming to office in mid-2016, Duterte has been no stranger to controversy, whether it be his obscenities launched against his opponents or his about-face on the South China Sea and tilt toward China and away from Manila’s treaty ally, the United States, which has shocked many at home and abroad. But of particular note has been the two-and-a-half year war on drugs, which has claimed at least 5,000 lives – although human rights groups say that number is closer to 20,000 through extrajudicial killings. This has continued despite Duterte’s own history of drug abuse, allegations made against his family of involvement in the narcotics trade, and Duterte’s confession that the only sin he ever committed was the notorious war on drugs (which understandably left some incredulous). To be sure, the Philippines is hardly the only Southeast Asian state that has been under international legal scrutiny for human rights violations. There are other examples as well, including the Cambodian genocide under the Khmer Rouge, for which trials are still ongoing, and the assault against the Rohingya in Myanmar. But Duterte’s bluster and self-incrimination has provided additional ammunition for those who want ICC legal action. Following Duterte’s statement that his only sin was extrajudicial killings, Human Rights Watch urged the ICC to speed up efforts to prosecute him, while Amnesty International said the confession should be added to the substantial body of evidence that already exists. Duterte has attempted to outwit the ICC, with the Philippines serving notice in March this year that it had officially withdrawn from the Rome statute. However, that will not excuse Duterte from crimes committed before then, and complaints have been lodged. How exactly all this will progress remains to be seen. The ICC’s announcement on December 5 about preliminary examinations of the country only said that it would continue its assessment of available information to determine if there was a reasonable basis to move forward on a decision. While that assures that international legal scrutiny remains on Duterte and his drug war, it does not really tell us much about how the ICC might in fact move forward. Duterte once said that he’d prefer to be shot by firing squad than jailed by ICC prosecutors. Though the former may not happen, given the vicissitudes of Philippine politics, a humiliating fall from power and into the waiting arms of The Hague ought not to be dismissed. The cloud of international legal scrutiny still hangs over Duterte, whether he chooses to acknowledge it or not. Does Duterte’s War on the International Criminal Court Really Matter? A closer look at an issue that has surfaced over the past few weeks.